My favorite thing about this time of year is spending time with friends and family. Getting together this time of year is so important! When I was younger, I was definitely intimidated by hosting and entertaining at this time of year. I put lots of pressure on myself to be the absolute perfect host. But one of the things I’ve learned as I’ve gotten older is that entertaining doesn’t have to be complicated. Casual get-togethers with friends and family are always the most memorable. We love to get-together with friends around the holidays, but we know it’s best to always keep it casual. That way it’s stress-free for us and our guests. Often we have people over just on a random weeknight for drinks and a simple dinner. It’s a nice way to get-together without taking time out of people’s busy weekends. We keep foods simple and make sure it’s something pretty quick to make, or something you can make-ahead. We also want it to appear elegant too. We want our guests to feel like I’ve put some effort in my cooking, even though I really haven’t! 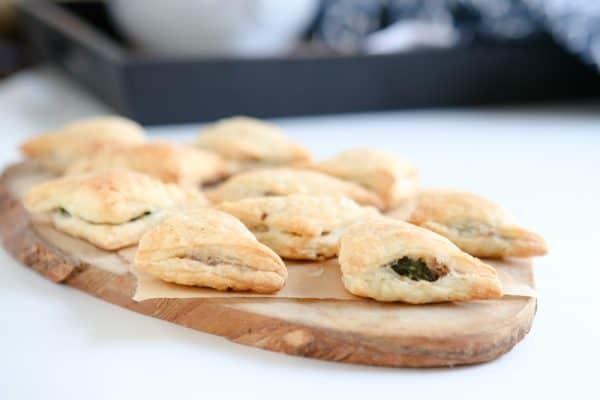 One of my favorite appetizers for the holidays is to make appetizers with puff pastry. 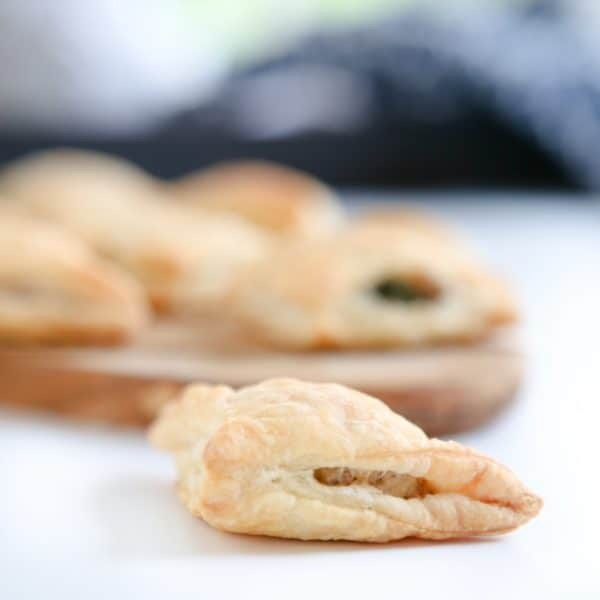 Puff pastry is my go-to entertaining ingredient. It’s so versatile and can be used in many ways. 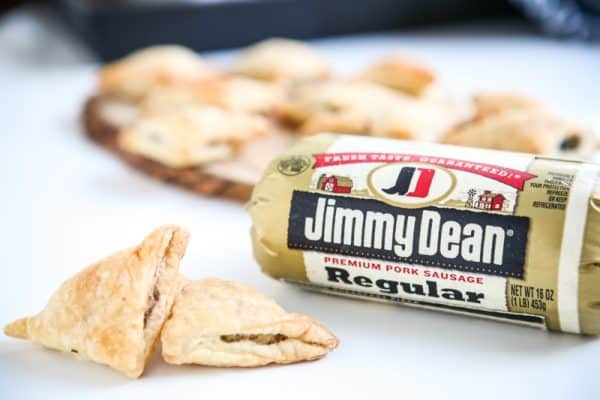 For these turnovers, I start with Jimmy Dean® Refrigerated Breakfast Sausage. It’s seasoned perfectly and adds so much flavor to this recipe. I brown it first in a skillet, breaking it up into crumbles. After the sausage is cooked, I add it to a large bowl along with a block of softened cream cheese and mix it well. Then I add an egg and some sautéed fresh spinach. The next thing I do is roll out the puff pastry and cut it into little 2 1/2 inch squares. Then I fill those squares with a little filling and pinch the corners together. Then I place them on a parchment paper lined cookie sheet and bake them for 15 minutes at 400°. After they come out of the oven, they are beautifully golden and perfect. You can serve them just as they are and your guests will gobble them up! I love using Jimmy Dean® Refrigerated Breakfast Sausage in recipes like this one, as well as other recipes for not only breakfast, but for lunch and dinner too! Their sausage is made with premium pork sausage and a signature blend of seasonings that adds flavor and excitement to meals! It’s so nice to treat my family to Jimmy Dean® products, rather than less expensive options, especially in the holiday season. It’s a little way to show them I love them! 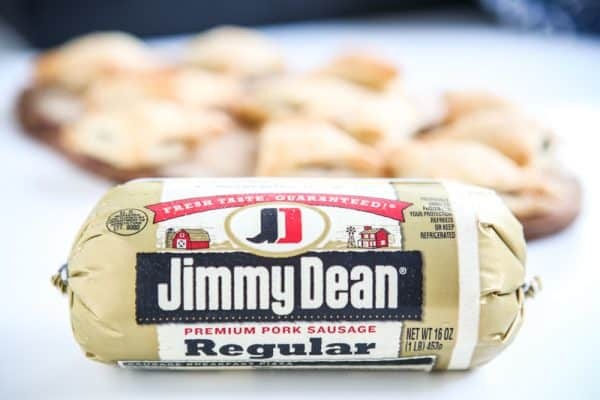 I always have a package of Jimmy Dean® Refrigerated Breakfast Sausage on hand in my house. You never know when you might need it! I use it for all types of recipes, not just my signature biscuits and gravy ;). Their products are perfect for all cooking occasions during the year and all holiday season long. You can find Jimmy Dean® Refrigerated Breakfast Sausage at your local Publix, plus all the other ingredients for this recipe. Use the Publix store locator to find a store near you. Heat oven to 400°. Brown Jimmy Dean® Refrigerated Breakfast Sausage in a large skillet. After sausage is done, add to a large bowl with cream cheese, mix well. Add egg and cooked spinach. Mix well to combine. Roll 1 sheet of the puff pastry to a 12 1/2 x 12 1/2 inch square. Cut 2 1/2 inch squares out of puff pastry. Add 1 level tablespoon filling to the middle of each square of puff pastry. Wrap pastry around filling and seal edges with fingers or a fork. Roll out and cut the other sheet of puff pastry and fill and seal them. 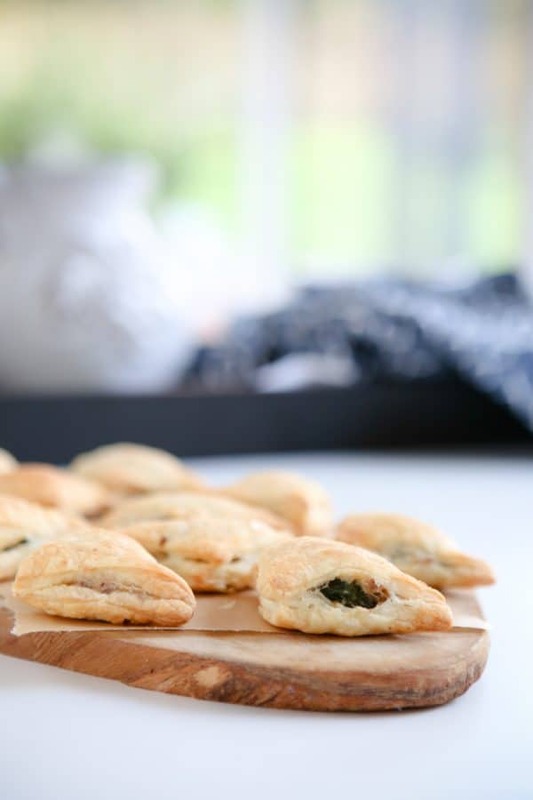 Bake filled pastry on a parchment lined cookie sheet for 15 - 17 minutes, or until golden brown. These are so perfect for the holidays. 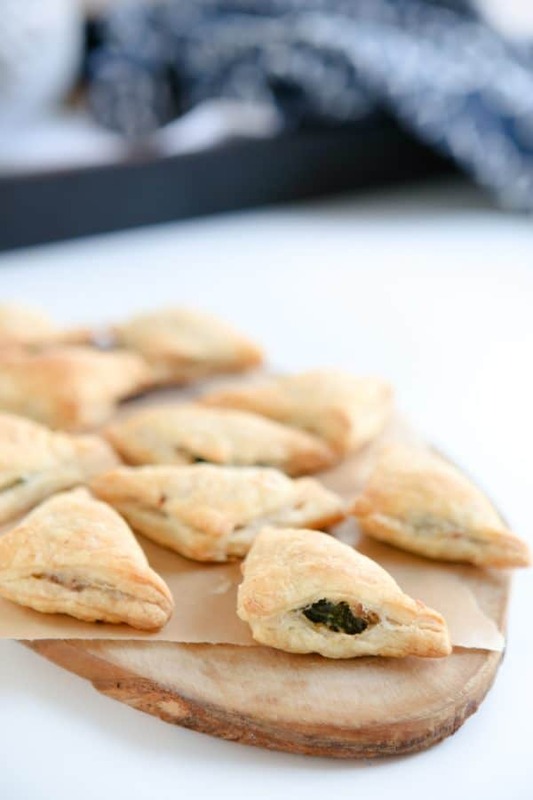 Love anything with puff pastry.